If your iPhone is locked when you receive a notification, slide the notification icon from left to right to launch the Messages app. If your iPhone is unlocked when you receive a banner notification, swipe the gray bar at the bottom of the banner downward. If your iPhone is unlocked when you receive an alert notification, tap the Reply button. To reply to the message on the screen, tap the text-entry field to the left of the Send button, and the keyboard appears. Type your reply and then tap Send. 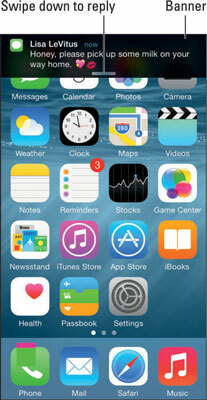 To read or reply to a message after you’ve dismissed its notification, tap the Messages icon. If a message other than the one you’re interested in appears on the screen when you launch the Messages app, tap Messages in the top-left corner of the screen, and then tap the sender’s name; that person’s messages appear on the screen. If you don’t see a Send button, try typing one or more characters. 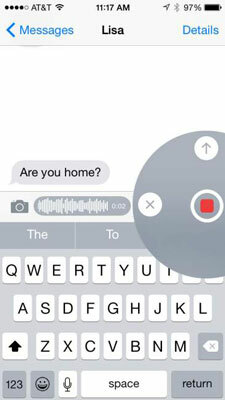 That action will replace the microphone icon next to the text-entry field with a Send button. iOS 8 adds an easy way to send voice messages instead of text. Just press and hold down the little microphone icon to the right of the text-entry field and a gray overlay appears. When you’ve finished speaking, swipe upward to send your voice message or swipe left to cancel. You can also tap the microphone key next to the space bar on the keyboard (not the one next to the text-entry field) and then speak your reply to Siri, who will translate it to text and type it in the text-entry field for you. 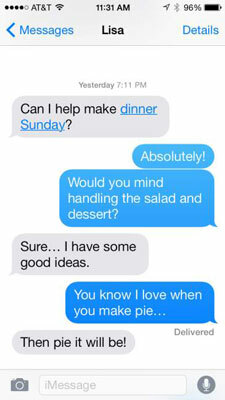 Your SMS conversations are saved as a series of text bubbles. Your messages appear on the right side of the screen in blue bubbles; the other person’s messages appear on the left in gray bubbles. Did you notice that the words “dinner Sunday” are blue instead of black and underlined? If you tap blue, underlined words, additional options appear on the screen, enabling you to create a calendar event, display the date on the calendar, or copy the event to the Clipboard (for pasting elsewhere). If you’re viewing the conversation: Double-tap any text bubble and then tap the More button that appears. You’ll see a little circle to the left of each text bubble. Tap a text bubble that you want to delete and a blue check mark appears in the circle. When you’ve added a blue check mark to all the text bubbles you want to delete, tap the blue trashcan icon at the bottom-left of the screen. Or, to delete the entire conversation in one fell swoop, tap the blue Delete All button in the top-left corner. If you want to forward to another mobile phone or Apple device user all or part of a conversation (as an SMS, MMS, or iMessage message), follow the same procedure (that is, double-tap a text bubble, tap More, and then tap the text bubbles that you want to forward). Now, instead of tapping the blue trashcan at the bottom-left of the screen, tap the blue arrow at the bottom-right of the screen. The contents of the text bubbles with check marks will be copied to a new text message; specify a recipient and then tap Send. If you’re viewing the list of text messages: Tap the Edit button at the top-left of the Messages list, and a circle appears to the left of each conversation. Tap the circle for each conversation you want to delete, and then tap the Delete button at the bottom right to delete those conversations. To delete a single conversation, swipe the conversation from right to left, and then tap the red Delete button. You can now tell Messages to either keep messages forever or automatically delete them after 30 days or one year.